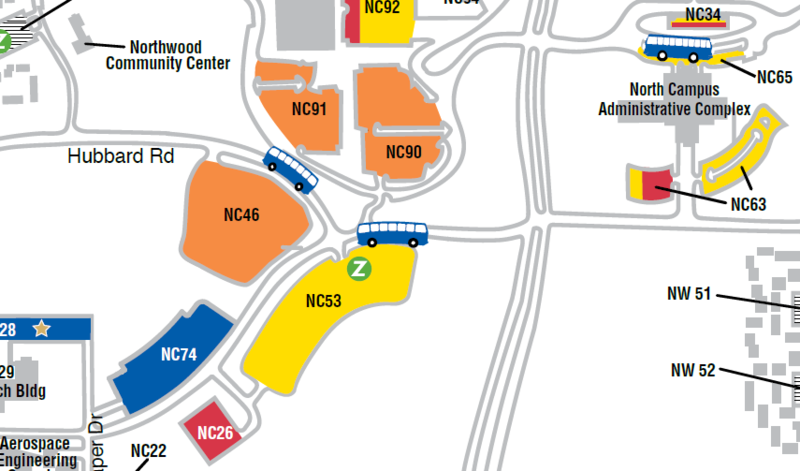 In order to ease parking conditions for commuters — and to help alleviate the nearly full conditions in the surrounding Orange permit lots at Hubbard and Hayward — the current Yellow NC53 lot will soon be split into two sections. The change, which will go into effect on Monday, Dec. 5, will allow the West side of NC53 to remain Yellow, while the East side is converted to Orange permit parking. This will mean 117 additional Orange permit spaces in that area for commuter parking. Those lots are served by the U-M Commuter bus, which runs every 10-11 minutes from 6:30 a.m.-7 p.m. Monday-Friday, and then every 15 minutes from 7 p.m. until 1:15 a.m. Please see the map above for a detailed look at the lot location, which is at the corner of Hubbard and Hayward.